Do it yourself fast food doesn’t get much better, or simpler, than this tasty dish! It’s perfect for feeding hungry hordes of kids’ adults and snack-attack victims of all ages. Quicker to make than the real thing, these French Bread Pizzas make a delicious and very easy snack. They can also be served with other dishes as part of an informal buffet-type meal or simple supper. Not only do hungry kids thoroughly enjoy eating these baguettes, but also, with a little guidance and supervision, they are easily prepared by kids too. The addition of a few dried peppers or mushrooms adds a little extra something to this sauce if you like them. Gently fry the chopped onions and garlic in the olive oil for 3-4 minutes. Add the canned tomatoes, puree, sugar and herbs.Stir it all together and bring to the boil, then lower the heat, cover and simmer for 15 minutes. Stir the mixture occasionally as it thickens. Remove your saucepan from the heat and take out the bay leaf. Allow the sauce to cool. Slice each baguette in half-lengthways-and then pop them under a hot grill to gently brown the cut side only. Spread some of your homemade tomato sauce over each toasted side of the baguettes-just enough to cover and form a moist base for the other ingredients. Arrange the sliced salami, ham, or other cooked cold meat on top of the tomato base. You need only use a small amount of thinly sliced meat or the whole thing becomes too dense and then knives and forks will be needed. Keep it simple! Next, add pieces of thinly sliced tomato, then mozzarella, then tomato, then mozzarella again, along the length of each baguette.Slice the olives so that they form thin rings. Arrange the olive slices on top of the ham/cheese/tomato already on the baguettes.Shred about half of the basil leaves and scatter the shreds along the tops of your baguettes. If your grill is big enough to accommodate all the baguettes at once, simply pop them under a hot grill for about 5-8 minutes. The mozzarella should melt and bubble and all the ingredients should be heated through. Alternatively, preheat your oven to 200ºC and bake the pizzas in there for about 15 minutes. 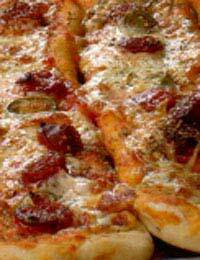 This is the easiest way of making them if you’re doing several batches of these pizzas and heating other foods too. When the pizza breads are hot and ready to serve, scatter the rest of the shredded basil leaves over the top and serve on warmed dishes. Great with vegetable soup for a quick and tasty lunch! Try experimenting with different toppings; just as you would with 'proper' pizzas.